Tennis Avenue Footbridge - Pensar. The Infrastructure People. Construction of a new steel and concrete footbridge across Breakfast Creek providing direct access from existing pathway networks. Construction works also included significant creek remediation works to minimise flooding and to stabilise the embankment. 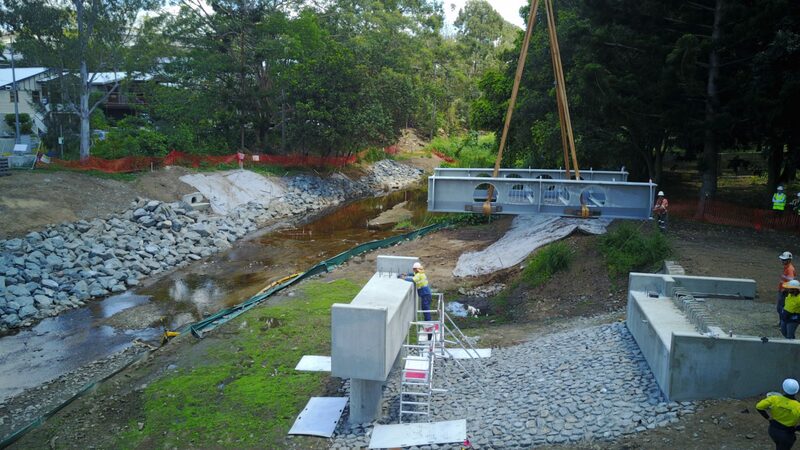 Installation of a new 30m long two span foot-bridge across Breakfast Creek. Stone pitched abutment protection to creek. Significant creek rehabilitation and stabilization works. Construction of a temporary piling platform. Installation of two (2) earth retaining walls. Demolition of existing footbridge over Breakfast Creek. Significant landscaping and hardscaping works. Construction of steel girders was completed alongside the site in order to ensure accuracy. Successful lift and place of 30 tonne steel girders at a range of 28 metres. Innovative method of transporting rock over the creek to improve efficiency.